Using a combination of vérité footage and compelling personal stories, State of Control shows a never-before-seen side of the Tibet/China struggle. 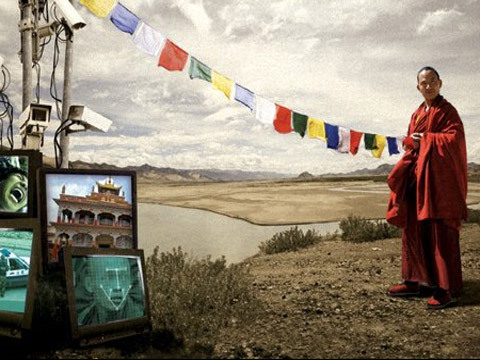 The film also broadens out to look at the global question of Internet freedom. This isn't just an issue for Tibetans; it's an issue that affects us all. State of Control tells the story of five individuals who try to battle China's repression in the restive region. First, there's a citizen journalist who is arrested for daring to talk with ordinary Tibetans. Then there's Tenzin Seldon—a young Stanford undergraduate who experiences China's grip on the Internet as well as the real world—who decides to take action. The third character is Tenzin Sundue, a veteran activist who is working to overthrow China's hold on Tibet. We also join two American filmmakers, Darren Mann and Christian Johnston, going undercover in Tibet. Christian Johnston is an award-winning director/producer/writer, and founder of Complex Films. His films include: September Tapes (Sundance 2004), True Life: Trial by Fire, Blackline: The Beirut Contract. Johnston has extensive film-making experience including filming in active war zones including the first western film shot in Lebanon in 35 years, and filming September Tapes in Afghanistan just six months after 9-11. Johnston is currently producing The Three Hikers the exclusive feature documentary about the three American hikers recently freed from prison in Iran. Darren Mann is an award-winning, Emmy-nominated director/producer and founder of Mann-made Pictures. He edited the 2004 Sundance and Cannes Film Festival hit September Tape. He directed/produced the documentary American Sumo and produced the documentary An Ox’s Tale, on the legendary rock band “The Who.” He directed the feature film, FIGHTF*CKPRAY. He recently shot/edited Becoming Barack, a documentary on Obama’s years as a community developer in Chicago. In addition to films, Darren has directed/produced hundreds of hours of broadcast television for such networks as National Geographic, Discovery, FOX, VH-1 Spike and ESPN, to name a few. His company, Mann-made Pictures, recently produced a ten-episode, animal-conservation series called Uncaged, airing on Nat Geo Int’l.